Beaches Turks and Caicos has a beautiful spot on Provo's best beach. While there are plenty of resorts and accommodations to choose from, Beaches Turks & Caicos paves the way for the most family-friendly, all-inclusive beach resort in this island nation and its baby care makes it a standout. The resort is organized by themed villages — The Caribbean, French, Italian and Key West — and each comes complete with its own aesthetic, kids clubs, choice of entertainment and restaurant themes. Guests choose from variety of room styles, private cottages for large families and reunions, waterpark, 19 international restaurants (and counting) and a new Key West Village expansion. It’s easy enough to stroll from one side of the resort to another if you fall in love with the Sky Lounge in Key West or Cafe de Paris in the French Village. But regardless of where you stay, kids will probably flock to the X-Box room; the 45,000 square-foot waterpark and slides; lazy river; and Bobby Dee’s burger, fries and kid-friendly fare. The newest addition to the Beaches Turks and Caicos property, Key West Village features complete villas from studios to four bedrooms. There are also standard one bedroom options with a full kitchen and chaise that doubles as a trundle bed. Although the new addition is welcoming to kids, it does have a distinctively upscale vibe with smaller pools, some of which are adult-only. Kids can enjoy the kids club outpost near the Key West reception area while adults wander over to the SkySky Lounge, Neptunes or Bayside Restaurant with waterfront views. Ask Bayside for a to-go box during the lunch or dinner buffet and stock up on fresh cookies and fruit for your room for a late-night snack. The Italian Village features 162 luxury family suites, gourmet dining, shops and restaurants like the brick-oven pizzas piping hot from Bella Napoli Pizzeria. Children and teens spend the day at the nearby Pirate & Mermaid themed Kids Kamp facility for ages 6 to 12, an Xbox Oasis Center game arcade, innovative science programs, and Crayola Art Camp activities. During the day, teens can gather at the nightclub Liquid, which has a sunken dance floor, water-themed space center with waterpark views, Internet access, a game room in a black light atmosphere, and DJ-training sessions through the Scratch DJ Academy. Stroll the cypress-lined boulevards of the more inland French Village, pool, swim-up bar and accommodations such as concierge suites with three bedrooms and four full bathrooms. Each can be configured for kingsize four poster beds and pullout sofas or double beds. Families like to gather in large dining rooms for breaks and snacks, and the connecting rooms make it easy to check on the kids at night. 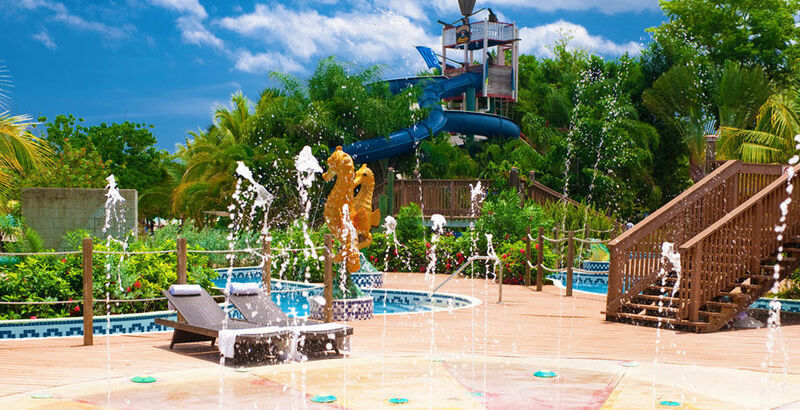 One big plus to the French Village is the close proximity to one of the biggest waterparks in the Caribbean, Pirates Island. Kids have a surf simulator, seven new adventure slides, pools, water cannon, splash deck, lazy river, play areas and can hop out to grab a drink and snack from Bobby Dee’s restaurant. One downside to the French Village is the lack of direct beach access, though simply walking over to the next Village will get you there in minutes. The oldest village on the property, the Caribbean Village features lush vegetation, hammocks, kids club beachfront access and the kid-friendly Arizona’s and cozy Schooners restaurants. The Village offers one bedroom options with pull-out trundles, but for a more spacious option, ask about the Caribbean Penthouse One Bedroom Butler Suite at 1,377-square-feet complete with a living room and balcony. The Caribbean Village also offers villas that can accommodate up to eight with patios extending out to the garden area. You can certainly go upscale at this village, but the rolling expansions that opened the Italian Village several years ago, and more recently the Key West Village, make it appear like a less luxurious option. The all-inclusive price of Beaches can be steep (an online bargain adult price recently started at $335 per person, per night; $47 for kids), but it includes non-stop food, drink and plenty of activities like access to the kids clubs in each Village. Water activities like snorkeling, kayaking, windsurfing, paddle boarding, scuba diving, hydrobiking, and hobie cats are just some of the options included in your price. And if your idea of getting adventurous in the water is cooling off after sipping Pina Coladas on the beach, try your hand at tennis, volleyball, croquet, basketball or hit the gym at the Fitness Center. Because of its terrific waterfront facilities, Beaches provides appropriate snorkel and learn-to-scuba equipment to guests who can either venture down the beach for a solo excursion or sign-up for a boat trip. For an extra fee, aspiring divers can get certified at the resort and start diving the very next day. Boat trips fill up fast and certification slots are limited, so reserve in advance and inquire about any age restrictions or special requirements for your kids. You’ll discover thoughtful and careful underwater pathways designed by the TCI National Parks Department to prevent unnecessary contact and continue the effort to protect the natural coral. The Beaches staff can also recommend excursions or dive areas for the most inexperienced to seasoned explorers. Off-resort excursions can be arranged through the Island Routes desk at Beaches for an additional price including the Provo Cays exploration, reel fishing, full-moon cruise, kitty katt catamaran cruise and private tours around the island with a driver. For an inexpensive ($20 for adults) and completely rewarding experience, sign-up for the Reading Roadtrip journey and visit a school in the local community. Gently used and new books are donated to the school’s library and guests take the opportunity to read to the kids or help with a lesson. The cost covers reading material, transportation and donation to the Sandals Foundation education fund. See a Reading Roadtrip in action. Need some adult time for all of the activities and off-resort excursions? Beaches Resorts are famous for their Sesame Street themes and activities, as well as Crayola art camps and kid-friendly amenities. The group daycare for babies is a big plus too, with newborns up to 23-months cared for by Certified Nannies in climate controlled nurseries with cribs, strollers, high chairs, rocking chairs, and plenty of age-appropriate toys and games. Parents looking for dinner out or an off-resort excursion can arrange for private babysitting at an additional charge. Beaches nannies undergo training to learn how to successfully engage and care for children, address safety concerns, conflict resolution, age-appropriate activities, work with special needs children, and are recognized as “Child Specialists” by Florida State University and the International Nanny Association. There are several age-appropriate kids programs. Two to 5-year-olds participate in shell collecting, face painting, treasure hunts, puppets, costume time, magic shows, and more with the supervision of nannies. Six to 7-year-olds have a special camp with baseball, kickball, swimming, arts, glass bottom boat rides, movies and plenty of opportunity to burn off energy. Eight to 12-year-olds spend the day sailing, playing beach volleyball, scavenger hunting, and dancing during reggae jam sessions. While there is no formal kids club for teens, kids 13 on up can hit the pizza and soda bars, karaoke, water sports, dance parties, and the chance to get away from Mom and Dad. Families on a togethering vacation can skip the kids’ club and bond over Sesame Street character breakfasts where Grover, Elmo, Abby Cadaby and friends stop by and entertain or take photo ops. Nightfall brings stage shows, island parties, dive-in movies right at the pool, and story time with Elmo. There were kids in the story time group we visited that had obviously outgrown Elmo years ago, but eagerly participated and rekindled some of that childhood magic. Plus, the selection of milk and cookies on hand probably didn’t hurt. Kids also have the opportunity to help bake cookies with Cookie Monster, make their own pizzas or go exploring with Grover. Teens can spend the day swimming, snorkeling, sailing, participate in Pool Olympics or at the X-Box Game Garage. Crayola Art Camps provide activities for the whole family with Caribbean-inspired games and projects to tap into their creative side. Children make their own island medallion, mosaic butterflies or lizards, magic wands, and decorate the resort with sidewalk chalk and waterproof markers for poolside murals and underwater scenes. If you have restless kids who’d rather play than sit still during mealtime, ask for a place setting and Crayola crayons at any of the Beaches restaurants. Older kids and parents can participate in mastering watercolors and pastels for their own creations. We hit the Red Lane Spa for a sports massage indulgence in a tranquil setting tucked away in the resort’s French Village wing. Hot stone massages, gentle massages, facials, wraps, body scrubs and treatments round out the varied spa menu. Mothers and daughters can relax at the tropical nail bar for an afternoon manicure or pedicure while sipping on tropical juices and cucumber water. If you choose to tip your spa therapist, keep in mind that the resort doesn’t have an ATM on property, and tips can only be offered in cash. On our last evening, we strolled on the beach and stopped by Barefoot in the Sand where guests kick off their shoes and sit with oceanfront views under soft lighting of the Italian Village. If you’re looking for a strictly no-kid affair, choose from Sapodilla’s or Le Petit Chateau for a cozy fine dining experience. We discovered that while Beaches takes the kid-friendly concept to a whole new level, we could escape the Sesame Street extravaganza with relative ease at its adult-only restaurants, solo resort activities, and late evening swims. My favorite part of the vacation? Sipping champagne on an oversized chaise lounge in a cozy gazebo with sparkling ocean views. While the award-winning Beaches has earned FTF’s “Top 10 Getaways” awards for their excellence in infant and childcare programs, the title “World’s Leading Family All-Inclusive” from World Travel Awards, and the Travel Channel’s special Top 10 Caribbean Resorts award; it’s not known for its reasonable pricetag. But is it worth the cost? Scoring a deal online, through a special or during off-peak travel season can make a Beaches trip to Turks and Caicos worth the investment if you intend to make the most of its kids activities, water sports and restaurants. It’s definitely an all-encompassing experience where the well-trained staff goes out of its way to ensure every detail is taken care of and guests are happy. So the answer on its worth depends on who you ask, and of course when you go. But if you ask me, Beaches lives up to the hype. This resort is for families who want to know exactly what they’re getting from spotless rooms with twice-daily turn-down service, butler options, an experienced and courteous staff, fun activities and the quality in every detail. It’s not for families who want to take multiple vacations a year and are on a budget, prefer to explore local life than unwind on one property and don’t care about an endless sea of restaurants and activities. It’s also not for families who aren’t good at unwinding together. Not everyone is suited for lounging on the beach and hopping a boat — others would rather be sprinting across an urban landscape to see its wealth of cultural attractions. There is another option — the day pass — to consider. Made up of 40 islands and cays (eight are uninhabited), the Caribbean’s Turks and Caicos Islands are situated 550 miles southeast of Miami and sit just below the Bahamas. And if you want to split hairs, the islands are actually in the Atlantic, but their culture is purely Caribbean. For such little islands with only 30,000 full-time residents, T&C opens its arms to the swell of tourists toppling 200,000 visitors annually. That’s why you’ll find many other family-friendly choices on Provo, the main island. Though it’s not widely advertised, Beaches does offer day and evening pass prices to enjoy its amenities and food without actually staying there. However, prices are subject to change (a recent quote was $200 per adult and $130 per child for a pass good for 10am to 6pm), and are not always available depending on resort events and guest capacity. Another risk? Passes can only be bought directly at the Beaches resort at roughly the time you want to go over, though you can confirm availability before you head over at 1-659-946-8000. Passes could be worth the spurge if you’re staying somewhere inexpensive or free through work or friends in Turks and Caicos; or just want to head over for the day with a plan to cram in as much fun, food and drink as possible. Of course you risk the kids falling in love with the resort and begging to go back. But regardless of how you spend your time and money at Beaches, make the most of what the resort is known for: quality, plenty of options to choose and luxury relaxation with families in mind. For more information and online specials available at Beaches Turks & Caicos, located on the island of Providenciales, Turks & Caicos Islands, BWI, visit the Beaches or call 888/Beaches.